This is a cake from cakes choux pastry and covered in custard with fruit, top fruit filled jelly. 1 C. of water to boil with 150 gr margarine and 0.5 tsp salt, brewing there 2 stack. flour, cool slightly and blend one 6 eggs. On two sheets of parchment, draw a pencil-sized meals, which are planning to submit the contour. It is necessary to fill the cells of 3×3 cm, one directly, the other obliquely. The calculated amount of dough to the thickness of the circuit 3-3. 5 mm and the size of the cake approximately 35×25 cm Essence: on a sheet of parchment to draw the size of the cake, smeared with oil. Put the dough in a pastry bag and squeeze out the first contour of a thickness of 3 mm(thicker don’t! ;), then begin to fill the middle — do the cells of 3×3 cm, no more! ; Bake in the oven at 180 deg. until Golden brown, 20-25 minutes. At this time, doing exactly the workpiece, but the cells are made diagonally. Have 4 cake layers, 2 straight, 2 oblique. Cream cook custard. To boil a liter of milk with a Cup of sugar,and pour in, stirring constantly whipped mixture of flour, milk and eggs.Cook until thickens.How cool, beat with a mixer the softened butter with the vanilla and cognac. at the dish for the filing put the first cake layer and fill the voids between the bars sliced fruit, coat with cream. 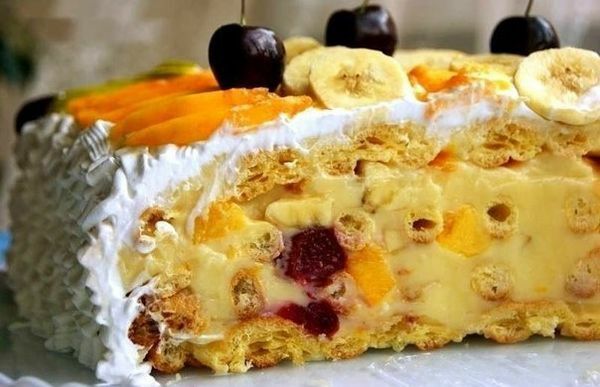 Then everything is in order: crust-fruit-cream. Upper Korzh grease cream without fruit, put it on thinly cut slices of any fruit and pour the jelly cakes. Leave overnight to soak in the fridge.